Here we are providing you updated and most relevant Study notes on Tort of Negligence for Law Entrance Exam. These study notes are highly recommendable for all those who aspire to crack CLAT, DULLB, AILET and other Law Entrance Exam. To understand this branch of Tort we need to study two theories given by jurists. According to objective theory it is a type of “conduct”. The objective theory is recognized and supported by Austin, Salmond and Winfield. According to Swayne J. of the United States “Negligence is failure to do what a reasonable and prudent person would ordinarily have done under the circumstances of the situation. 1. That the defendant was under a legal duty to take reasonable car towards the plaintiff to avoid the damage complained of. 2. That the defendant committed a breach of that duty. 3. That due to breach of the duty plaintiff suffered damage. The conduct of a person that he would behave ,in such a manner a reasonable person would have behave in like circumstances when a person does not behave like a reasonable or prudent person, he is said to be careless. A person is liable for his careless if he is under a legal duty to take care towards the particular person. One must take reasonable care to avoid acts or omissions which you can reasonably foresee would be likely to injure your Neighbours. If a person owes a duty of care and commits a breach of that duty, he is said to have committed negligence. A person is neither expected to act like a super human nor like an insane or unreasonable and imprudent person. The law therefore requires that standard and degree of care on the part of a person which should have taken by a reasonable and prudent person in the like circumstances. Case Law : Surendra Shetty V. Sanjiva Rao AIR 1982, Karnataka 84. It has been held that when the Driver is in School zone, there is greater responsibility on the driver to see that the speed of his vehicle is so controlled as to be also to stop it in moment’s notice. - Headmaster of school permitted 60 boys along with two teachers to go for Picnic to a spot on the bank of river Sabarmati. The boys were playing and both of the teachers started taking lunch together. - The two young boys were found drowning in river, one was rescued by fisherman but other one Jagpal aged 12 years died. - It was held that river water was on amusement as well as a trap, under the circumstances, a greater care was necessary. Teachers should not have taken food together. While one should have taken food and the other should have supervised the young boys. The teachers failed to take due care and were held liable. The school authority was held vicariously liable. The general rule is that in an action of negligence the burden of proof is on the person who complains of negligence. Things speaks for itself The maxim is a rule of evidence. It establishes the prima facie case of negligence against the defendant. It means the mere accident tells its own story and raises the inference against the defendant that he was negligent in performing his part. A man bought a bottle of a ginger beer for his girlfriend manufactured by the defendant. The lady drank the contents of the bottle directly. Later, she poured the remaining contents into a glass. To her utter shock, she noticed that a dead snail popping out of the bottle. She fainted and fell ill, as she had already consumed a portion of the drink. It was held that the manufacturer was liable to the lady for “negligence”. Three person died as a result of collapse of the clock tower situated opposite the town hall in the main bazaar of Chandni Chowk; Delhi belonging to the appellant corporation. - Tower was 80 years old and normally have 40-45 years life. It was not maintained by the corporation and no notice was displayed about its poor infrastructure by the municipal corporation. - The mortar was deteriorated to such an extent that it was reduced to powder without any century properties. - Towers tells its own story that prima facie, Municipal Corporation was negligent and was held vicariously liable. - Gate of railway crossing is open. - Trenches dug by the side of the road. Case Law : Byrne V. Boadle. The plaintiff was walking on the footpath of a street. Suddenly, a barrel of flour fell upon him from the upper floor of the defendant’s warehouse. Held that the barrel of flour had fallen only from the building beneath which the plaintiff was walking. The learned judge in this case observed ‘A barrel could not roll out of a warehouse without negligence on the part of those who have control and who should have exercised reasonable care’. There was a manned railway level crossing, whose gates were kept open. The plaintiff, who believed that there was no train in the vicinity, tried crossing the gates. His vehicle collided with a railway engine. It was held that the Railway Board was liable on the basis of maxim “res ipsa loquitor”. The fact that the railway gate was open amply shows the gross negligence of the Railway authorities. The defendant wrongfully put a pole across a highway. The plaintiff, who was riding violently at dusk, did not notice the obstruction and ran into it and was injured. Held, he could not recover damages as he failed to take due care to avoid the accident. The Wagon Mound was an oil tanker ship. Due to the negligence of the servants on the ship, oil dripped from the ship. Unfortunately, there was a big tide, which carried the oil to the wharf. In the wharf, some employees were involved in welding operations. The sparks from the welding came in contact with the oil and resulted in fire. Held that the plaintiff was not liable as he could not have reasonably foreseen that the oil could be carried to a far away spot and cause fire. The test laid down in Scott V. London St. Katherine Docks Co.
a) That the things causing the damage be under the control of the defendant or his servant. b) That the accident must be such as would not in the ordinary course of things have happened without negligence. The relationship of a counsel and client depends on mutual trust. The counsel should be careful in performing his professional duties. If a counsel by his act of commission causes any loss to the client the counsel will be liable. Manjit Kaur, a widow whose husband had been killed in a motor accident filed an appeal for enhanced compensation through her counsel. The case remained on daily list for two weeks and then it was dismissed in default even the application for rehearing the appeal became time barred. Keeping in view the serious ailment of counsel and unconditional apology tendered by him, he was warned to be careful in future and was directed to return the fees he received and to compensate the party for cost of Rs.1000/- awarded against the party for the rehearing of the appeal. Every profession requires reasonable degree of care and skill. A surgeon is required to exercise reasonable care and skill equivalent to a member of his class. When a medical practitioner attends a patient he owes him following duties. 1. A duty of care in deciding whether to undertake in case. 2. A duty of care in deciding what treatment to give. 3. A duty of care in the administration of the treatment. The breach of any of the above duty of care in the medical profession will present in negligence and the aggrieved party would be entitling for compensation. 3. Lack of preventive measures resulting in doctors. 5. Death due to transduction of blood of a wrong group. Note: Doctor owe a duty to maintain privacy/secrecy towards the patient but to avoid a greater harm if a doctor exposes a information then it is not civil wrong as then is justification behind it. Example: A doctor passed information to Ms. Akili about the health of her fiancé who was HIV+. Ms. Akili broke her engagement with her fiance. Later on he brought an action against the doctor for breach of duty to maintain privacy. Court held that doctor is not liable. When the plaintiff by his own want of care contributes to the damage caused by the negligence or wrongful conduct of the defendant, he is considered to be guilty of contributory negligence. For e.g. A, going on the wrong side of road, is hit by a vehicle coming from the opposite direction and driven rashly by B, A can be met with the defence of contributory neglegience. The conductor of an overcrowded bus invited passenger to travel on roof of bus. The driver ignored the fact that there were passengers on the roof and tried to overtake a cart. It is based on the fact that who was having the last opportunity to avoid the accident. The one who was having the last opportunity will be totally liable for the loss. The last opportunity could be with the plaintiff or with the defendant. In this case, the plaintiff tied the forefeet of his donkey and negligently left it on the highway. The defendant subsequently came along that way, driving his wagon and horses at a faster pace than he ought to have done-under the circumstances with the result that the wagon ran over the donkey and killed it. It was held that the defendant was liable, notwithstanding the fact that the accident would not have happened but for the negligence of the plaintiff. In spite of the plaintiff’s negligence, he was held entitled to recover damages because the defendant had “last opportunity” of avoiding the accident. 3. A person is neither expected to act like a super human nor like an insane or unreasonable and imprudent person. 4. What are the specific defences one can claim against negligence? 6. Res ipsa Loquitor means? 7. A man bought a bottle of a ginger beer for his girlfriend manufactured by the defendant. The lady drank the contents of the bottle directly. Later, she poured the remaining contents into a glass. To her utter shock, she noticed that a dead snail popping out of the bottle. She fainted and fell ill, as she had already consumed a portion of the drink. Will the manufacturer be liable for negligence? 8. The gate of railway crossing is open when a train is passing. Does this amount to negligence? 9. A counsel by his act of commission causes any loss to the client the counsel will be liable. 10. A doctor passed information to Ms. Akili about the health of her fiancé who was HIV+. Ms. Akili broke her engagement with her fiance. Later on he brought an action against the doctor for breach of duty to maintain privacy. Does this amount to negligence by the doctor? 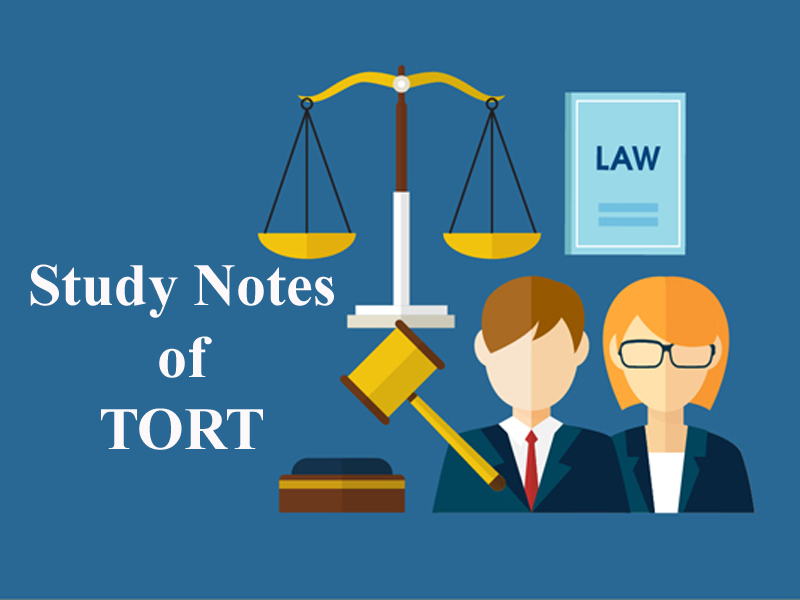 Get the updated and most relevant study notes on Torts in Negligence for upcoming CLAT and other Law Entrance Examination.